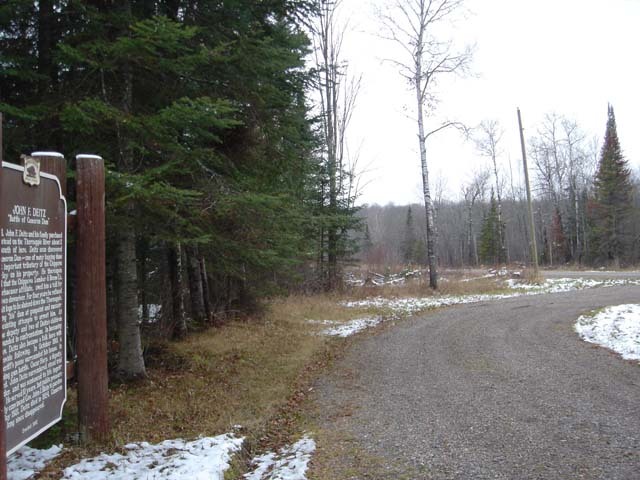 Located 6 mi southeast Winter WI cr-W Coordinates Lat N 45:47'026" Lon W 90:53'554"
In 1904, John F. Deitz and his family purchased a farmstead on the Thornapple River about 2 miles south of here. 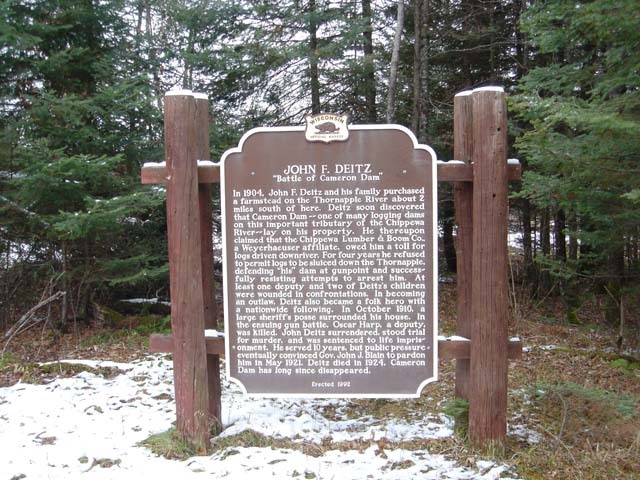 Deitz soon discovered that Cameron Dam --one of many logging dams on this important tributary of the Chippewa River~~lay on his property. He thereupon claimed that the Chippewa Lumber & Boom Co.. a Weyerhaeuser affiliate, owed him a toll for logs driven downriver. For four years he refused to permit logs to be sluiced down the Thornapple, defending "his" dam at gunpoint and successfully resisting attempts to arrest him. At least one deputy and two of Deitz's children were wounded in confrontations. In becoming an outlaw, Deitz also became a folk hero with a nationwide following. In October 1910, a large sheriff's posse surrounded his house. In the ensuing gun battle, Oscar Harp, a deputy, was killed. John Deitz surrendered, stood trial for murder, and was sentenced to life impris~onment. He served 10 years, but public pressure eventually convinced Gov. John J. Blain to pardon him in May 1921. Deitz died in 1924. Cameron Dam has long since disappeared.